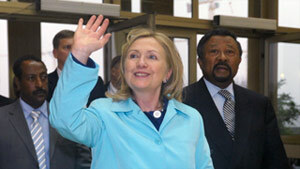 U.S. Secretary of State Hillary Clinton arrives at African Union headquarters in Addis Ababa, Ethiopia, on Monday. Tripoli, Libya (CNN) -- As Washington urged African countries to reject the government of Libyan leader Moammar Gadhafi, rebels reported progress Monday against government forces in western mountain cities. After a siege of nearly two months, rebels have freed the city of Al-Rayyana, northeast of Zintan, said Talha Al-Jiwali, a rebel fighter. Nine rebels were killed, and 35 were wounded, he said. Al-Jiwali said forces entering Al-Rayyana found that more than 20 residents had been killed, a number of the women had been raped, and the town's electricity and water had been cut. In nearby Zawiet al-Baqool, just east of Zintan, 500 to 600 government forces retained control, but the fighting was ongoing, he said. Al-Jiwali added that nearly 100 members of Gadhafi's forces were killed in the two cities and that rebels confiscated their vehicles and arms. The reports of fighting came as U.S. Secretary of State Hillary Clinton urged countries in Africa on Monday to kick out diplomats representing Gadhafi's government. Clinton made the remarks at a meeting of the African Union in Addis Ababa, Ethiopia. She urged countries to "suspend the operations of Gadhafi's embassies in your countries," expel pro-Gadhafi diplomats and "increase contact and support" with the Transitional National Council, which represents the main opposition to Gadhafi's rule. "Your words and actions could make the difference in bringing the situation finally to a close and allowing the people of Libya, on an inclusive basis, in a unified Libya, to get to work writing a constitution and rebuilding their country," she said. A handful of countries, including France and Italy, have recognized the Transitional National Council as the legitimate representative of the Libyan people. A larger number have agreed to provide it financial support. The United States views the council "as the legitimate interlocutor for the Libyan people during this interim period," Clinton said last week in the United Arab Emirates. On Monday, the UAE notified Gadhafi's ambassador in that country that his diplomatic status there will expire in 72 hours, a diplomatic source in the country said. The UAE has recognized the Transitional National Council as the legitimate Libyan government. World powers beefed up financial and moral support for the Libyan opposition last week at an international coalition meeting aimed at charting the course of a post-Gadhafi Libya. At that meeting, in the United Arab Emirates, Clinton announced an additional $26 million in U.S. aid for the victims of Libya's ongoing war. She also said time will be on the international coalition's side so long as Gadhafi faces sustained pressure. Italy pledged up to $580 million to the Transitional National Council, which is facing a budget shortfall, to cover its expenses, but not weapons, Foreign Ministry spokesman Maurizio Massari said. Kuwait will donate the $180 million it promised in April for humanitarian needs, said Sheikh Mohammed Sabah al Salman al Sabah, the Gulf nation's deputy prime minister and minister of foreign affairs. CNN's Kareem Khadder contributed to this story.